The 2013 EPRI- Hoisting, Rigging & Crane User Group Meeting and Workshop was held in Long Beach, CA and featured a field trip to Lift-It® Manufacturing Company, Inc. Over 65 attendees were part of the plant tour and workshop that featured an educational session, as well as a several fabrication demonstrations. Michael J. Gelskey, Jr. welcomed the group outside the factory and took one of the two groups on the factory tour. The tour featured fabrication demonstrations of web, round and Twin-Path® Extra slings. An overview of the Lift-It® ISO: AS9100C quality control system, material traceability and final inspection were also presented. The highlight of the tour was destruction testing of slings which had been produced for the tour attendees. Simultaneously, Michael J. Gelskey, Sr. was presenting a Rigging Standards and Regulatory Compliance update in the Lift-It® Learning Center. Attendees were updated on recent developments in the OSHA sling safety standards, ASME sling and hardware consensus standards and the Recommended Standard Specifications of the Web Sling and Tie Down Association. In addition, a report commissioned by the U.S. Department of Energy on sling accidents resulting from the lack of sling protection or inadequate protection was also provided. Dequoy R.M. Weaver also presented an interactive, educational session on Synthetic Sling Inspection during the regular meeting. 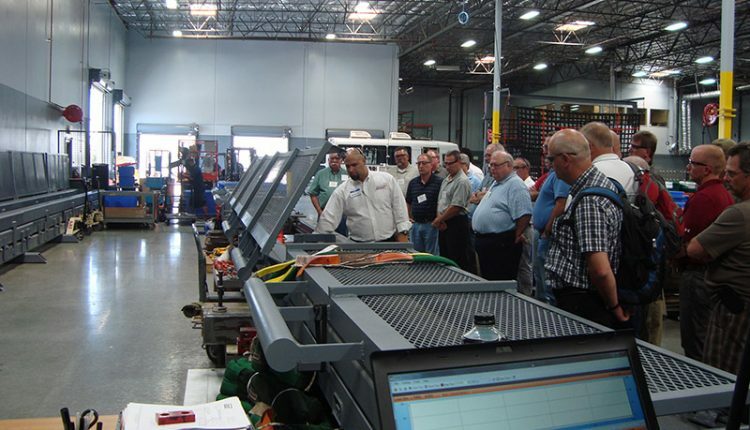 The attendees were presented with sling inspection system information, removal from service criteria and sling inspection techniques. The day concluded with an Appreciation Dinner hosted by Lift-It® for the participants at Parker’s Light House in Long Beach, CA. The event was held in the Queensview Steakhouse which has breathtaking views of the Queen Mary and the Port of Long Beach. The night ended at 9:00 PM after the group enjoyed sumptuous cuisine and libations. Lift-It® Manufacturing Company is a leader in the supply of quality rigging, worldwide for discriminating customers who know there is no substitute for quality. Lift-It® celebrates 34 years of service to the sling and rigging industry and provides world class education for sling riggers and inspectors at the Lift-It® Learning Center in Pomona, CA or onsite. For more information on Lift-It® visit www.lift-it.com or contact them at 909.469-2251.